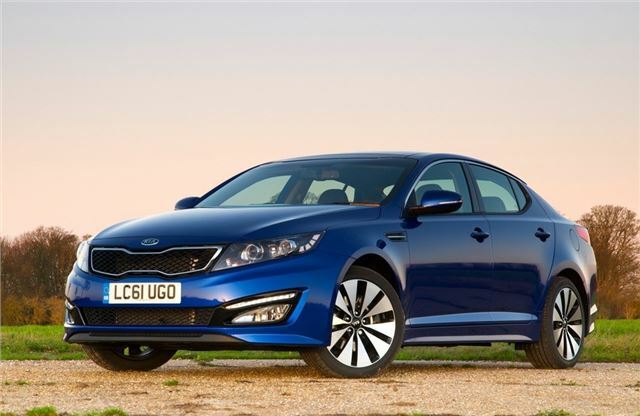 Kia has confirmed that its new Optima will go on sale in the UK, with sales starting on 1 February 2012. The Ford Mondeo-sized saloon will be the 'flagship' model in the Kia range with prices starting at £19,595 on the road. In the UK it's aimed mainly at business users so comes with just one engine, 1.7 CRDi diesel with 134bhp and claimed economy of 57.6mpg with the standard six-speed manual gearbox. Emissions are just 128g/km which means low Benefit-In-Kind tax for company car drivers. All manual versions of the Optima come with including Intelligent Stop & Go, which cuts the engine in traffic to save fuel. Automatics have an Active ECO button which alters the operation of the engine the compressor on the climate control system, bringing potential fuel savings of around 9 per cent. While the Optima has proved popular in its home country of Korea, where it became the top selling car within a month of going on sale, it will be more of a challenge for Kia in the UK market where the brand isn't known for larger saloons. Its last model was the uninspiring Magentis. So the brand is including a high level of equipment as standard including features never previously available on a Kia. These include a high-end Infinity audio system with 12 speakers, self-parking, heated and cooled seats, a panoramic sunroof, a reversing camera and a new six-speed automatic gearbox which Kia claims is among the most advanced around. As you can see from the pictures, the interior looks pretty good, with a design that has apparently been based on aircraft principles. This means that all the major controls are within the driver's line of sight. The entry-level Optima has a standard three-instrument dial layout, but all other versions get a premium 'Supervision' cluster with a 3.5-inch colour information screen that has the rev counter on one side and a speedo on the other. Inside, Kia says the Optima has 'class-leading passenger and luggage space' particularly for front passengers who get plenty of legroom. Boot capacity is 505 litres while the rear seats split and fold 60/40. It's also very safe with all mdoels getting Electronic Stability Control (ESC) linked to Vehicle Stability Management (VSM). Ride and handling have been optimised to provide the 'perfect' combination of stability and agility according to Kia along with refinement and comfort for long motorway journeys. There are three trim levels following Kia's now standard 1, 2 and 3 names. Standard features include alloy wheels, air conditioning, LED daytime running lamps, a leather steering wheel, Bluetooth with voice recognition and music streaming, steering wheel-mounted audio controls, all-round electric windows and electric folding mirrors as well as cruise control. The top Optima 3 model comes with a panoramic sunroof, automatic lights, the Infinity audio system and touch-screen satellite navigation with integrated reversing camera. Xenon headlamps, full black leather upholstery, a cool-ventilated driver’s front seat, heated rear seats and an automatic parallel parking assist system are also included. As with all Kia models, the Optima comes with a seven-year or 100,000-mile warranty, subject to conditions covering wear and tear items. The warranty is fully transferable to subsequent owners.